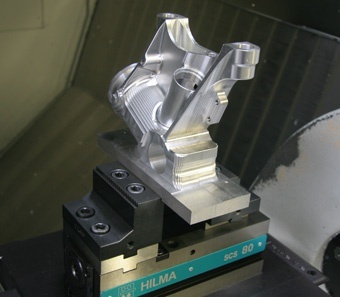 When Hemlock Engineering Ltd invested in two of the fastest 5-axis milling machines in the world in 2005, they knew that they needed vices that would help them maximise the machining capabilities. That is why they specified Hilma SCS120 and SCS80 vices from Roemheld. As well as the two 5-axis Mikron 7 pallet machines, with high-speed spindles, Hemlock also runs 13 CNC machines enabling this Nottingham-based company to offer both high volume and niche machining supported by a full in-house design service. The company produces parts for printers for the food industry as well as supplying general sub-contract engineering for the aerospace and automotive industry. The introduction of the 5-sxis machines in 2006 has enabled Hemlock to undertake more specialist work, leading to new clients including a Formula One contract and enquiries from the military. 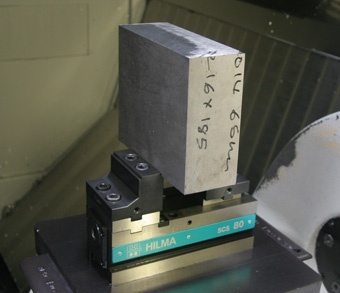 However, Hemlock has also found that 5-axis machining involves more expertise and more staff training than is required for simply producing volume work. The company believes this promotes good practices as the operators have to be very accurate setting up the machine and use lasers to set the tools and probes for positioning. CAD/CAM is also an important part of 5-axis machining, resulting in a need for operators who can model in CAD and machine in CAM. The Hemlock 5-axis machines undertake varied materials, primarily of titanium or aluminium and the machined units ranges from small components to large plates. Export makes us a large percentage of Hemlock’s business at the moment and this trend looks set to continue. The 5-axis capabilities continue to generate a large number of enquiries and Nick believes that specialist work is the way forward for the company. He said: “A lot of volume work is going over to Eastern Europe from the UK but it is starting to come back due to quality and reliability issues. Hemlock can offer the more complex machining capabilities that are at a premium within the market and, with our 5-axis machines combined with our design and engineering expertise, we can attract niche work in specialist areas that many competitors simply cannot tackle.